Di Vapor have been supplying shower enclosures for almost a decade, working with a varied level of customer bathroom requirements. We thought it would be a good idea to talk about one of our popular corner quadrants cabins under the spotlight this February – The Cascade steam shower enclosure. If you’re looking at renovating your bathroom or shower space, it really doesn’t get much better than this. If you’re in the middle of a bathroom renovation, you’ll be familiar with what’s available in the marketplace. Buyers tend to go down two routes – ultimate practicality or luxury at any cost. Cabins from Di Vapor provide a delicate balance of both, ensuring that you have an option for everyday showering whilst providing a solution to relaxing in your very own private spa. With most renovations limited by the space available, it is important to remember that a steam room doesn’t require a large 3m x 3m space or bigger. All that’s really needed is space of approximately 1m x 1m – enough room to fit a one person cabin. 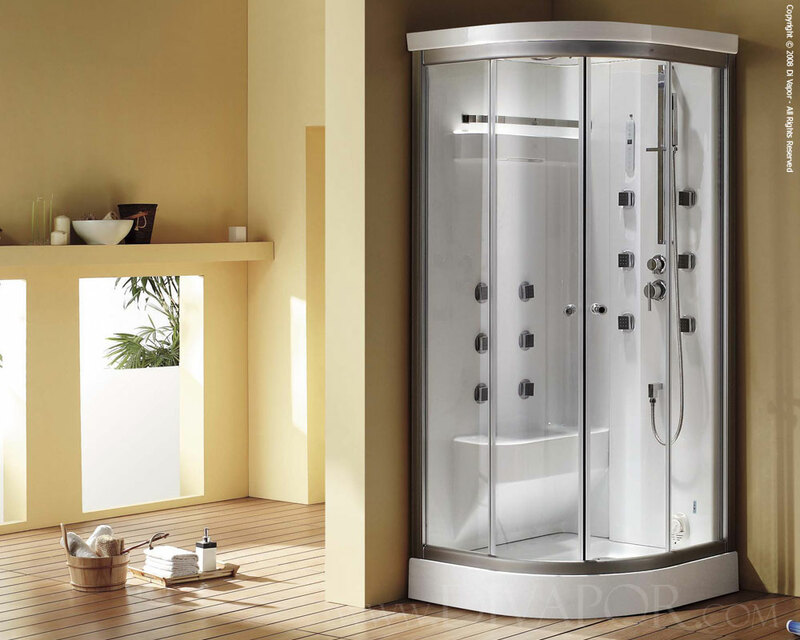 Di Vapor offers plenty of one person solutions including the The Cascade quadrant shower enclosure, standing at a size of 900mm x 900mm. The Cascade achieves a contemporary look by combining bold features with straight edged transparent glass panels. The simplified design is coupled with a practical large bench seat, offering comfort to the user during a 30 minute session. With the cabin being constructed from a combination of reinforced acrylic fibreglass, aluminium and glass, the sheer weight of such material requires a strong foundation. This is provided through a raised acrylic fibreglass reinforced tray (for easy plumbing) that’s also finished in white for continuity throughout. This unit would settle well in a brightly decorated bathroom finished in large black or white marble tiles – this is your home spa haven after all! Now it’s all well and good if something looks the part, but can it provide everything that you need in order to class the Cascade as a complete home spa solution. To get things started, the Cascade comes complete with an overhead monsoon shower mounted flush into the top piece – perfect for getting completely drenched. This is coupled with a handheld shower (great for cleaning) and hydro massage body jets lined across both back panels. But it’s the built in steam generator that really appeals to the wellness cravers amongst us – a simple press of a button kick starts a constant flow of warm steam into the cabin. Temperatures can get up to 60 degress celcius but for health and safety reasons, it’s important that you don’t stay in for too long – 30 minutes is enough for most users. Partner this with a fully programmable FM radio and you’ve got yourself a true spa escape in the comfort of your own home. For more information on the Cascade steam shower, head on over to Di Vapor today. There’s something for every size, shape and taste so be sure to take a look – your body will thank you for it. Many of us believe that in order to maintain a healthy heart, serious action is needed such as the intake of medicines and rigorous diet changes. The truth is, simple short term changes can have lasting long term effects. Spending time relaxed rather than being stressed can halve your heart disease risk, so why not create your own haven in the comfort of your own home? Plenty of natural light, soothing music and an abundance of fresh flowers are great starting points. Have a dedicated quiet space in the house to ensure you have a place to think without interruption. Our hearts are healthier when in the company of others that we know and love. Try not to make excuses by not having enough time, and surround yourself with family and friends! It’ll do wonders for your well being, without you even thinking about it.